English is a language rich in vocabulary, some words having almost peculiar specificity. Among the most peculiar and specific known to this bookseller is “Encaenia”. Perhaps you know the word. I confess that “Encaenia” did not join my own vocabulary until this year. Apropos, my Oxford English Dictionary tells me that it is “The annual commemoration of founders and benefactors at Oxford University”. 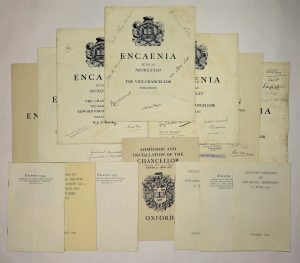 Among the 40 items in our forthcoming catalogue is a collection of Oxford Encaenia program(me)s rendered unique by the signatures of 53 distinguished honorees. 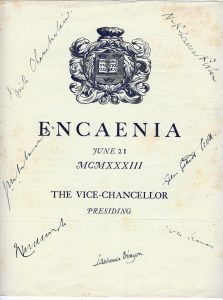 The signatures include Prime Ministers Winston Churchill, Neville Chamberlain, and Harold Macmillan, President Harry S. Truman, three Nobel Prize winners, House Speakers and Party Leaders, scholars and war heroes, poets and architects, and such quintessentially British figures as the first Director-General of the BBC, the editor of Punch, and the designer of the London’s iconic red phone booth. These signatures were collected by Lewis Frewer, an Oxford autograph collector whose meticulously catalogued collection of personally acquired signatures of statesmen, sportsmen, and figures of the stage and screen totaled over 2,000 items. 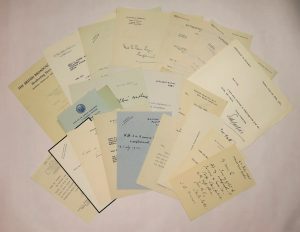 This portion of his collection includes 12 signed programs and 35 additional items chiefly comprising letters attesting to the provenance for many of the signatures. As you might expect, the condition of the items varies. 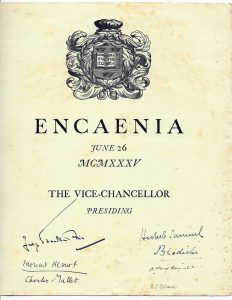 Programs handled by a limited number of people, such as those signed by the Churchills and Truman, are in very good condition, bright and clean with minimal wear to the extremities. Others, such as the 22 June 1932 program, were clearly been sent back and forth through the mail in the process of collecting multiple signatures, and hence bear fold lines, attempted repairs, tears, and visible wear. 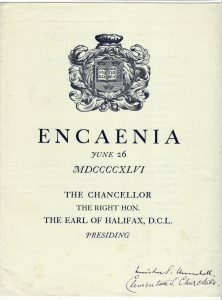 The Encaenia ceremony at Oxford has existed since the 16thcentury as a means of conferring honor upon, and obtaining favor from, the powerful and influential in the form of honorary degrees. 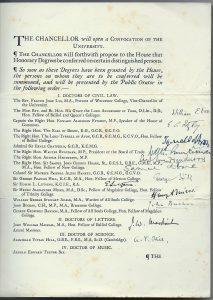 This means of using honorary degrees to create alliances extended from the academic realm to the British Government by the 1930s when the Foreign Office reportedly came to regard the honor as a diplomatic tool and began to directly intervene in the selection of honorees. Reflecting this practice, in this collection are the signatures – all collected in the years leading up to WWII – of foreign dignitaries such as Austrian Minister Baron Georg Franckenstein, French Prime Minister Édouard Herriot, and Belgian diplomat H. E. Baron de Cartier. This level of political calculation was interestingly juxtaposed with the infamous 1933 Oxford Union resolution stating that “this house will under no circumstances fight for its King and Country”, a resolution denounced by Winston Churchill as an “abject, squalid, shameless avowal”. The “King and Country” resolution aside, in the first half of the 20thcentury, the honorary degrees awarded largely reflected the contributions of British and Allied leaders in the two World Wars, with nearly half of the honorees in 1946 being military figures. Military heroes present here include Admiral of the Fleet Viscount Cunningham of Hyndhope, who was ranked “with the greatest of British admirals”, Air Chief Marshal Lord Dowding, who was credited with a crucial role in winning the Battle of Britain, Lieutenant General Lord Bernard Freyberg, whose lengthy military career which spanned beach landings at Gallipoli to the Battle of Greece prompted Churchill to nickname him “the Salamander” for his ability to pass unharmed through the fire, and Field Marshal Lord Alanbrooke, the chief military advisor to Churchill. Of course, the figure central to Allied victory, Winston S. Churchill, is also present. 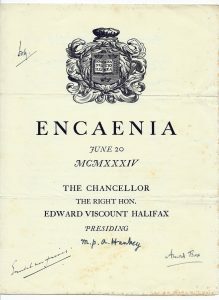 However, the honor of Doctor of Civil Law was not placed on the wartime Prime Minister but on his wife, Clementine, whose signature nevertheless appears below her lauded husband and who is referred to in the program as only “Mrs. Churchill”. President Harry S. Truman’s inclusion in the 1956 Encaenia was fraught with political controversies. In 1952 Oxford honored Dean Acheson, the US Secretary of State under Truman. Ostensibly, this was a politically safe pick. However, 1952 was an election year, one tainted with anti-communist Cold War rhetoric. After Senator Joseph McCarthy attacked Dean Acheson as soft on communism, Oxford’s decision seemed a miscalculation and was perceived by some as a gesture of support for the foreign policies of the Democratic Party. Two years later Oxford’s Vice-Chancellor proposed Truman’s nomination to Foreign Secretary Antony Eden, whose response was an explicit “no” as the US midterm elections were approaching and the nomination of another prominent Democrat might lend the appearance of intervention. 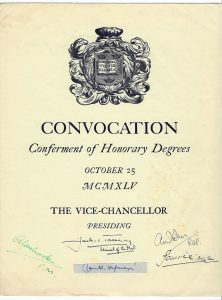 There was additionally some discomfort at awarding an honorary degree to the individual who had given the order for the first atomic bomb to be dropped. Immediately after the elections Truman’s name was resubmitted for 1955 and approved. However, Truman would not be able to attend the ceremony until the following year. This again made more trouble for the Foreign Office, as 1956 was an election year, creating a conflict between the embarrassment of delaying the former President’s honor and the consequences of perceived favoritism in American elections. The solution was to include Truman in the 1956 ceremony while making it explicit that he was a holdover from the previous year. Truman’s inscription, that “it is a very great honor”, might be regarded as gracefully acknowledging the political maneuvering required to include him in the Encaenia. Below you’ll find a full list of Encaenia and signatures, as well as additional images.